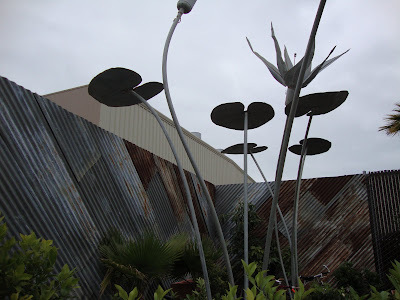 The first garden-oriented place we visited on our vacation was Flora Grubb Gardens in San Francisco. This place has gotten so much press that I feared it couldn’t help but disappoint. Not the case, it was a great welcome to California. This piece in particular was all over the internet a few months back. Amazingly it was even better in person and still looking fresh and vibrant. 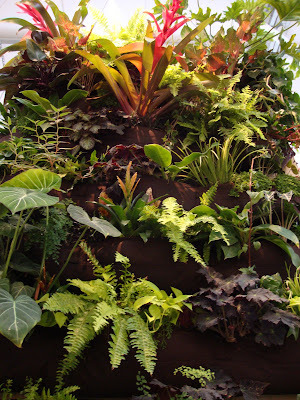 Something I worry about with vertical gardens…how do they look over time? For some reason I envisioned the nursery location being very suburban, maybe north in Corte Madera. Not the case, the nursery is located just south of downtown in a fairly industrial area. Everything was so colorful and well tended. There weren’t many people there early on a cloudy Monday morning so we had the place pretty much to ourselves. There was so much color everywhere we looked! 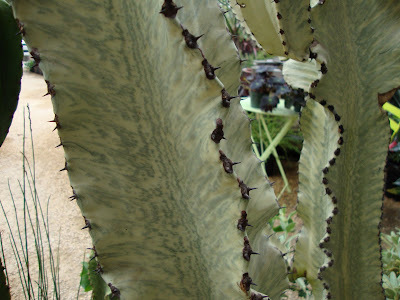 I've dubbed this the "Marmoleum Cactus" - doesn't it look like Marmoleum? This could very easily have gone bad, but I love it! I've got a neighbor with a few "classic" cars parked on the street. I wonder if I could get away with this treatment? Flora Grubb does stock tanks! And more metal...lots of metal! A display for Woolly Pocket. A product I was skeptical about but it seems to be doing the job here. 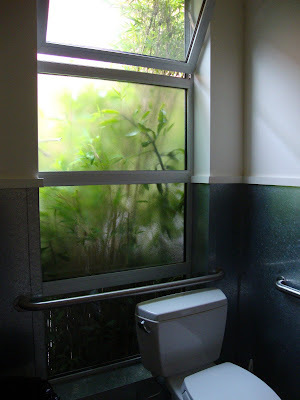 Luckily I ducked in the powder room, what a great green wall behind the loo! I love it when areas like this are considered and part of the overall aesthetic of a place, not the scary restrooms that you sometimes discover in a retail location. Imagine yourself relaxing on these lounge chairs. They actually are very comfortable! 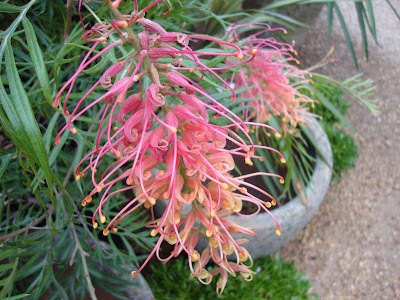 If you find yourself in the Bay Area...check them (and the nursery) out for yourself! 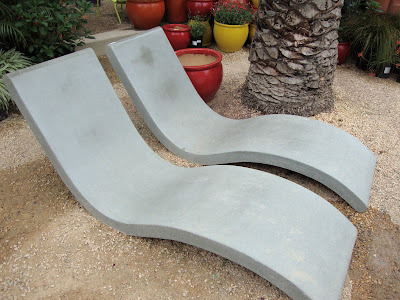 The lounge chairs would look right at home in your garden. They have to be comfortable, because once one gets down there, getting back up might be challenging for gardeners' knees. "Sorry, dear...I'm stuck in this chair...could you just pass me the mint julep?" Oh, so much fun, DG! I was thinking the same thing as Ricki--the challenge of getting up after a leisurely lounge and a few mint juleps. Dear God I'm getting old. ... The car is fabulous. 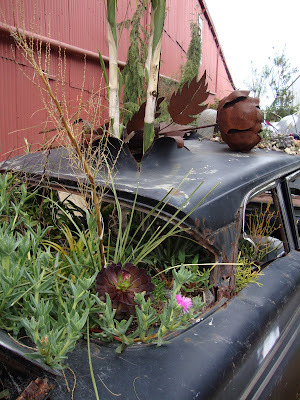 Not exactly the thing every suburban gardener could pull off but very cool. 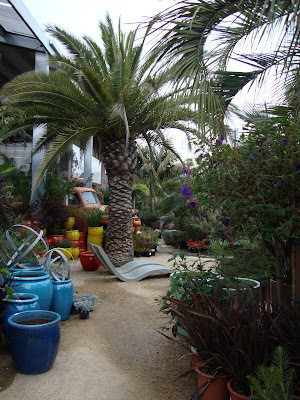 I like the rusty pots holding the Echiums. [?] Were the colored chairs hanging on the side of the building for sale? There is no way I would have been able to leave without a couple of those. Pink of course. 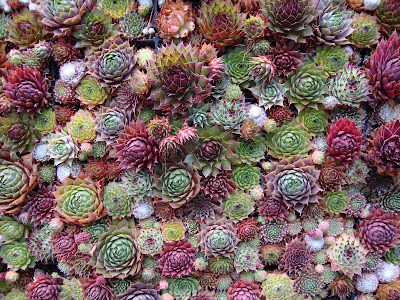 The framed, hens and chicks--now THERE is artwork! Fun. I look forward to the next installment. I'm so glad you took such great photos. 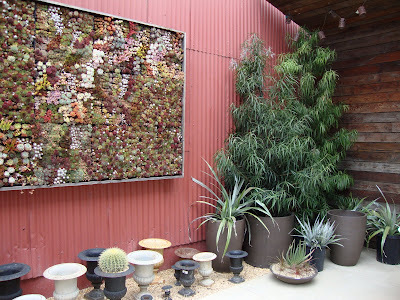 Love the vertical wall art. Longview Ranch could use a few of those but the soil would probably wash out in our winter rains...like today! Perhaps woolly pocket is the better alternative for our locale. 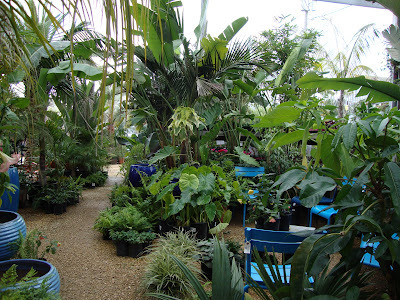 Thanks for sharing this great nursery and please tell me you brought home a few souvenirs! What great pictures. That is a magical place. I'm laughing at Grace's comment about pink chairs. There was some lovely pink in the vertical garden as well. Glad you enjoyed your vist-that is so my favourite nursery! 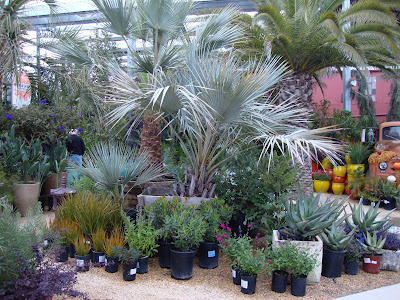 And the displays, plants and garden stuff is always changing. A great combo of two of my favourite hobbies-art and gardening. Oh good, I'm glad you checked them out. Sometimes a place is worth all they hype. 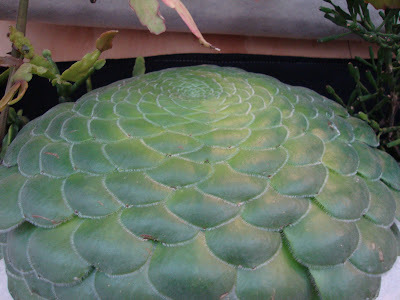 Can you imagine a climate where you can grow those plants, and living by a nursery like that? Heaven. I wish I would have ventured out there when I visited last year. I don't know what I was thinking. Thanks for the tour. I love the wall piece and the car!! My husband has a few too many "classics" too. Oh he'd kill me though lmao!! 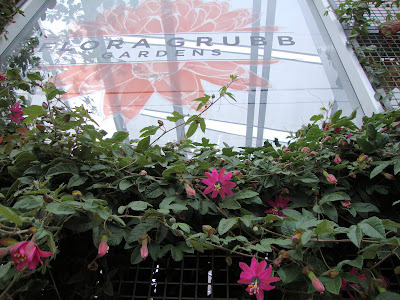 Thanks for the tour of Flora Grubb's nursery. It looks fabulous. 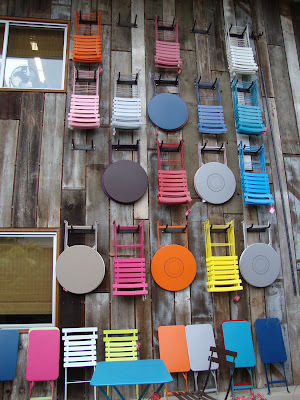 The colorful bistro tables and chairs are sold at Barton Springs Nursery here in Austin too. In fact I have two of the yellow chairs. I'd love to see all FG's metal work in person. 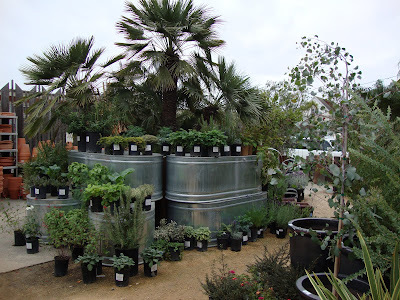 I think it's interesting that stock tanks can be purchased right at the nursery. 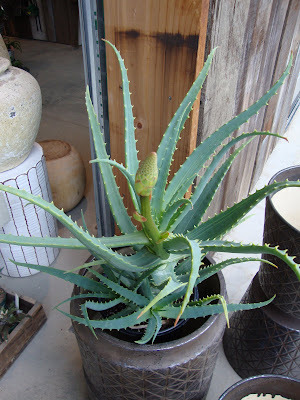 I've never seen them for sale in all of Austin's nurseries, though of course they're readily available at local farm-supply stores. I suppose there'd be a mark-up at the nursery anyway. Grace, well now I am going to have to be on the look-out for those chairs around home...you must have a few pink ones! 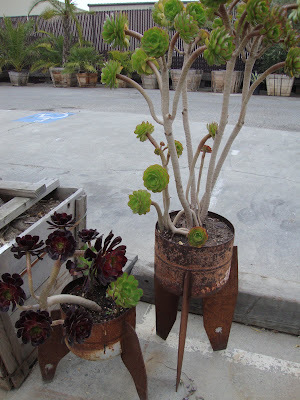 I believe they are aeoniums in the rusted pots. Jane, funny story about the souvenirs...if you read Fridays post you'll understand! 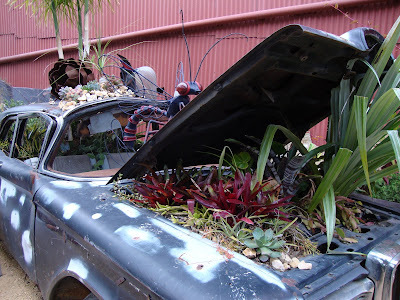 VW, your right...that vertical garden was amazing! Nicole, I can see why it is a favorite. I wish it were here in Portland. Although I'd be broke. Uhm...maybe Flora could open a Portland outpost and I could run it...??? Megan, can I imagine? NO! What a wonderful world it would be. Pam, you know I didn't even look at the price of the stock tanks! I was so overwhelmed (in a good way). Normally something like that wouldn't have escaped me. Great overview of your Flora experience. 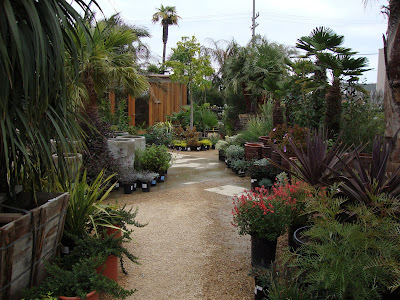 I went to the nursery yesterday and it was looking fantastic. I enjoyed seeing the nursery through you perspective.